In my last post, The Good, the Bad, and the Ugly in Year-End Fundraising – Part One, I gave examples of how organizations thanked me, welcomed me as a new donor, and recognized my monthly gifts after I gave my year-end donations. In many cases, I didn’t receive anything except a boring, email thank you acknowledgment. With a little extra effort, you can do better than that. In this post, I’ll give you the good, the bad, and the ugly of how organizations are staying in touch since I made my donations at the end of November. I know it’s only been about six weeks, but organizations should reach out at least once or twice a month in ways in which they are not asking for money. Here’s some of what I’ve received so far. One organization sent an email holiday greeting with pictures of cute kids, a link to a great video, and no donation request. I’ve included the link to their video because I think it does a nice job of capturing what the organization does in two minutes. You could do something like that, too. Three other organizations sent email holiday greetings. Another was combined with an ask. A couple of organizations sent holiday cards with donation envelopes. This is a huge pet peeve of mine. Sending holiday greetings is a great way to reach out. Don’t ruin the moment with a donation request. A couple of organizations wished me a Happy New Year and sent a New Year’s update. Some sent New Year’s and year-end thank yous. 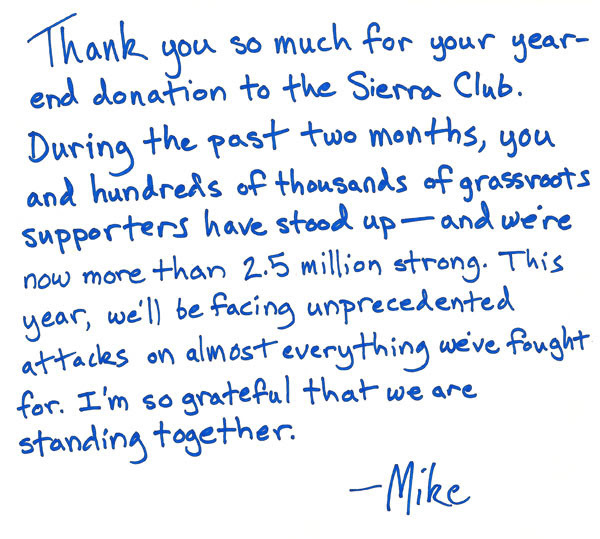 One large organization sent an email handwritten thank you note. Yes, it’s somewhat impersonal, but it would have been impossible to send actual handwritten notes to 2.5 million supporters. Holidays and different times of the year are a great way to connect. Find creative ways to say thank you and update your donors on Valentine’s Day, St.Patrick’s Day, the first day of spring, Mother’s Day, Father’s Day, etc. I donated to several social justice organizations. Some are keeping in touch with regular updates and advocacy alerts. Encouraging people to contact their legislators about important issues is another great way to engage without asking for donations. Two organizations just sent short, five-question surveys by email. One asked what issues are most important to me and the other was a combination of questions about issues and gathering some personal information. This is yet another great way to connect, and you could also ask questions about communication preferences – Do your donors prefer print, email, social media, or a combination of those? The key is to keep your surveys short. Those five questions took no time to complete. Speaking of print communication, I do think organizations should communicate by mail a few times a year. Some smaller organizations don’t use direct mail because they think it’s too expensive. This is a mistake. Your donors are more likely to see a print piece than an email or social media message. Larger organizations don’t have a problem with print communication; the problem lies in what they’re sending. It’s unlikely I’m going to read your wordy 10-page newsletter, so you might want to bump that down to four pages or make it very visual with photos and infographics. One of the new organizations I donated to sends a bi-monthly magazine, which I just skimmed through. Remember, your donors are busy, and less is more. Handwritten notes, postcards, and two to four-page newsletters and annual reports are great. Anything longer than that may go directly in the recycling bin. Also, give some thought to the content. Include donor-centered updates filled with gratitude. And, make sure it’s easy to read. That teal background may be pretty, but it makes it hard to read. So do does your small font. By far the most communication I’ve received in the last six weeks were additional donation requests with no indication that I had donated recently. I know the end of December is the busiest time of the year for fundraising and sending multiple fundraising requests to people who haven’t given yet is necessary. But what about the people who have already given their year-end gift? Try to personalize these requests. Either don’t send one to people who have already given or include a thank you to those people. A couple of more palatable ways organizations asked for an additional donation this year was to request one on behalf of someone as a holiday gift or to give a specific need. For example, one organization cited a recent fire that left 32 families homeless. Otherwise, it looks like you’re treating your donors as if they’re money machines when you send a continuous stream of impersonal donation requests. The Worst End-of-Year Email of 2016 Give some thought to your year-end requests and intersperse them with holiday greetings, thank you messages, and engaging updates. While I’ve seen examples of good, bad, and ugly communication, I should add another category – nonexistent. Some organizations aren’t communicating at all, and if that continues you’re not making a good impression. I’ll write another post in a couple of months to see how these organizations continue to communicate with me. Thanks for the great post. For Orgs that want to send fewer than 2.4M but more than – a lot – and also want to send something handwritten, they can try HappyDonors.net. 🙂 HappyDonors.net can do cards and letters with our handwriting solution and can also automate the process to send using rules or your current software.